One of the themes that has been running through our exhibition and social media is a little figure the team named Dale. 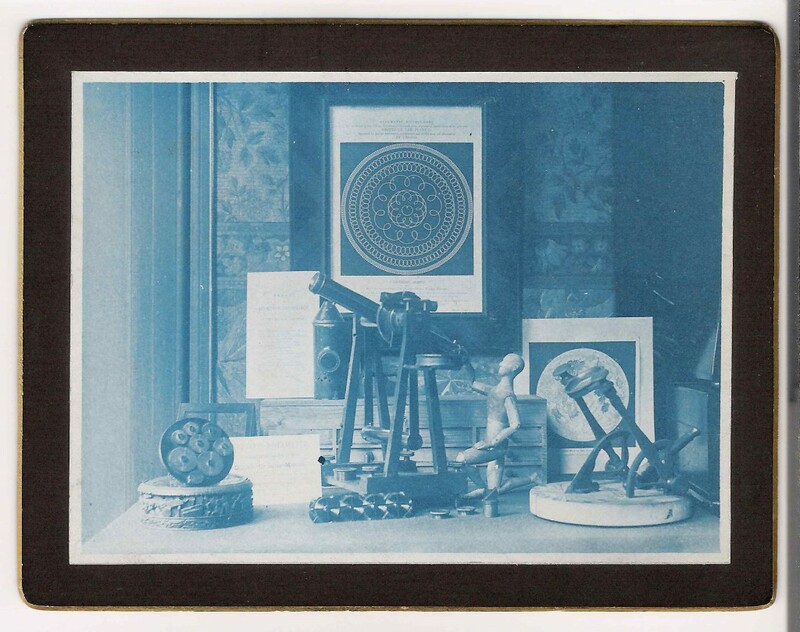 Dale is inspired by the wooden figure present in Washington Teasdale’s cyanotype photograph titled ‘Still Life Arrangement of Items Relating to Astronomy‘, and a replica of the photograph is present in our physical exhibition. 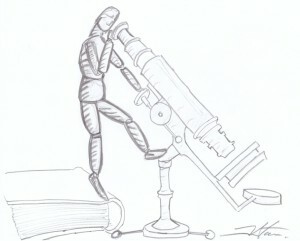 In this photograph the wooden person has been arranged to show the passionate amateur astronomer, dedicated to his subject. 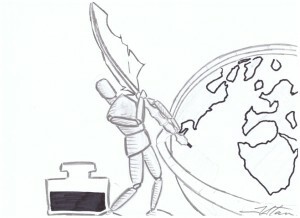 For us, the figure represents everyone in our project who is doing everyday science ‘for the love of it’. Because of this, we wanted to bring it to life, and so we bought a wooden figure just like the one in Teasdale’s photograph and called it Dale. We have taken Dale on a range of adventures to other museums, and he helped out with our event and other scientific projects, which we talked about on our twitter! In addition to our physical Dale, we have a number of fun drawings of Dale running through our advertising material and exhibition graphics. For those of you who can’t make it to the Museum to see these, we have added them below. 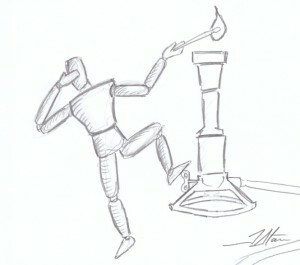 All credit for these fantastic drawings goes to Trevor Stace. 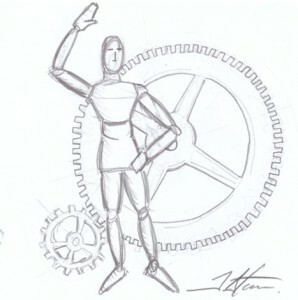 When it came to designing the drawings, Trevor Stace had full artistic license to do anything that he thought would represent the exhibition and our goal to show that science can be, and is, fun. 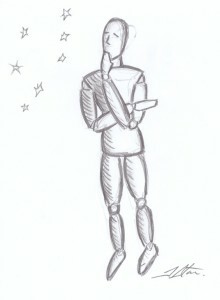 We gave him a list of objects from memories which had been given to us at that point and using that he created the images below. 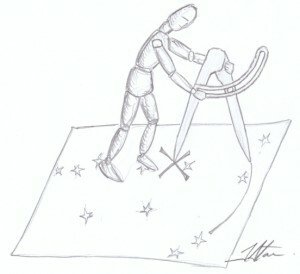 He later stated that he enjoyed the process of trying to portray Dale doing science activities, especially since he envisioned Dale being so small. But, it shows that no matter what size you are, you can pursue and explore things that interest you. ‘For the Love of It’ is a student exhibition at the Museum of the History of Science in Oxford that looks at memories of science and scientific objects, past and present. 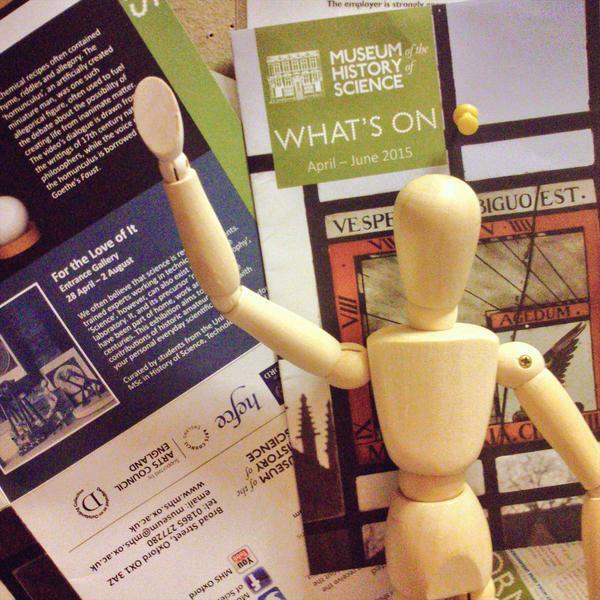 Our physical exhibition, running from Tuesday 28th April till 2nd August, showcases five personal stories from visitors to the Museum, and also the stories of two historical amateurs, who, like us, did science for the love of it. 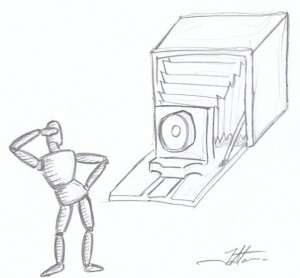 This online blog will be a place to share personal stories and fond memories of scientific objects from our daily lives. These stories can help us to see how science plays a role in what we often consider to be non-scientific activities. Think of the candy thermometer used to make caramel, or the metronome used to keep time in a musical performance. Both of these have been developed from scientific principles, but often we do not think of them as ‘scientific’. We hope to be able to collect a range of these stories from visitors to the Museum and online blog, to show that you do not need to be a scientist to enjoy or interact with science! We will also be aiming to illustrate the stories with pictures of objects of the same type which are found in the Museum’s collections, linking your stories to the Museum. Perhaps you will spot one of these photographed objects if you visit in person. If you have a story to share, please submit it through the ‘Submit a Story’ link at the top of the page, so we can add it to the blog. If you have any general questions or would prefer to send us a story by e-mail, please contact robyn.haggard@history.ox.ac.uk.